Blessed is the nation whose God is the LORD; and the people whom he hath chosen for his own inheritance (Psalm 33:12). America come back to God. America belongs to God. Jesus Christ is the true source of liberty in every area of life: spiritually, emotionally, physically, financially, and relationally. Lady Liberation is only a prophetic symbol that proclaims to America that Jesus Christ is the Way, the Truth, and the Life; no man can come unto the Father (God) but by Him. Neither God nor our Founding Fathers intended for Christianity and its practices to be separated from schools or public life. As a result of our laws removing Christian practices from our educational institutions, our schools and our nation are reaping the negative consequences. Lady Liberation affords us the opportunity to call forth righteous foundations in our nation. With a cross in her right hand and God’s Ten Commandments in her left, Lady Liberation compels America to return to the Lord Jesus Christ and His laws, which made it a great nation (Ezra 7:25-26). 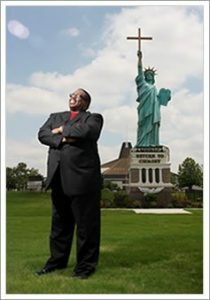 Part of the apostolic call on Apostle Alton R. Williams’ life is to remind America about its godly heritage and leave a legacy for Christ to the next generation. The Lord’s Lady Liberty stands as a symbol of that call (Exodus 3:15). The U.S. Supreme Court, in the case of Runkel vs. Winemiller, ruled that America was a Christian nation. Also, the U.S. Supreme Court case of Updegraph vs. Commonwealth in 1824 stated that Christianity was the acknowledged religion of the nation. Lady Liberation is an outward evangelistic witnessing tool for the thousands of people who drive by who may never enter the doors of a church. It is designed to reawaken awareness of the intent of our Founding Fathers, who established this nation on a Judeo-Christian foundation.